Glistening forests blanketed in snow, sparkling ski slopes and sun-bathed mountain cabins. Anyone looking for a picture-perfect winter landscape will have come to the right place! So why not spend an unforgettable holiday at Hotel Theresia Garni in St Johann in Tirol! Experience the sensation of hitting the slopes at a top-class family ski resort. 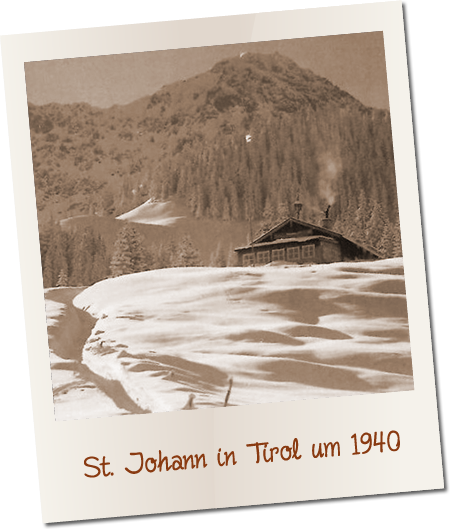 The St Johann in Tirol cable car station is just three minutes on foot from the hotel. 17 cable cars and lifts transport you quickly and comfortably to 43 kilometres of diverse slopes covering all levels of difficulty. At the start of each downhill run, rustic cabins with sun-drenched terraces provide the perfect place for taking a break with family and friends. In the Kitzbühel Alps, 250 kilometres of well-groomed cross-country ski runs await both classic and freestyle cross-country skiing enthusiasts. Nine different routes are available, making the region a cross-country paradise for young and old alike. And, who knows, perhaps we’ll be seeing you at the start line of the next international Koasalauf skiing race! The 2.5 kilometre floodlit St Johann toboggan run guarantees high–speed fun in the snow both during the day and at night, when visitors can race down the slope under a starry sky. Just put on some warm clothes and you’re ready to snowshoe or trek through the glittering deep snow. Discover unspoilt nature between St Johann, Kirchdorf and Oberndorf by exploring 100 kilometres of well–maintained winter hiking trails or by venturing off-piste. The Kaiserbach Valley and the track towards Harschbichl make for a true winter wonderland for ski touring.